I never met the New York Times photographer William J. Cunningham but he was definitely one of my most favourite people. Wearing his trademark blue French workman’s jacket, Bill Cunningham peddled around New York on his bicycle, taking photographs of street fashion for his On the Street column. Bill’s favourite place to photograph was the corner of 57th Street and 5th Avenue. He took all the photographs, wrote up his columns and directed the layout of On the Street. His take on fashion was that clothes were the armour you put on to survive the harsh reality of daily living. In order to ‘never be owned’ he lived very simply. ‘I don’t have charge cards, I do away with what weighs people down.’ He sometimes forgot to cash his pay checks if there was nothing he thought he needed. Money didn’t interest him and he slept on a small cot bed, alongside his filing cabinets crammed with his photographic archives. His modest wardrobe hung off the filing cabinets on wire coat hangers. Bill worked from eight in the morning until about midnight. Most evenings he was out at fashion events for his Evening Hours column. Fame found him but he had no time for it. For eight years he refused to let two filmmakers make a film about him. Eventually he relented and the film, Bill Cunningham New York opened to rave reviews. On the night of the NY premiere he arrived, photographed the fashionistas in attendance and quickly left for another social event before the film had even started. In 2018 his book, Fashion Climbing: A New York Life was published. He tells about his earlier days as one of the most celebrated mid-century hat designers, creating fabulous hats for society belles, working women and ladies who lunched. Bill’s book dwells on the fun and perils of extreme creativity, his love of beautiful things, ready wear design and high couture. His sense of joy is there on every page. I particularly loved the tales about how he created his stylish hats and transformed his hat salons into exotic temples of flamboyant beauty. One stinking hot summer he was creating his outrageous straw beach hats that had to be moulded while wet. His studio morphed into a sweat box, so he sat in a cold-water bath all day, feverishly transforming the straw into strange ocean creatures. Every time the phone rang he leapt out of the bath, streaming water everywhere as he rushed to answer. It was worth it – his unique, witty sunhats were much sought after by beachgoers and fancy-dress party goers. Photograph: That’s Bill on the left – wickedly grinning and clearly amused by the shenanigans going down at a New York fashion event. 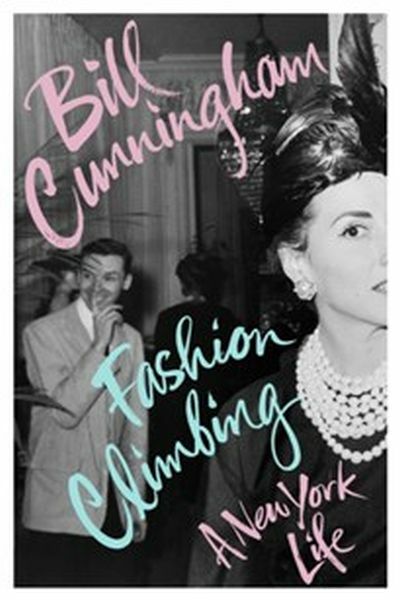 Cover of Bill Cunningham’s book, Fashion Climbing: A New York Life.